Besides the great art on the walls there was some serious design going on: Nadine Bouler's cloche for example. There were so many pieces we loved it was difficult to choose what to bring home. None of the pieces we picked is in these shots but if you wander over to Nadine's site you'll find them. I'm not going to be more specific until they arrive at The Cool House! 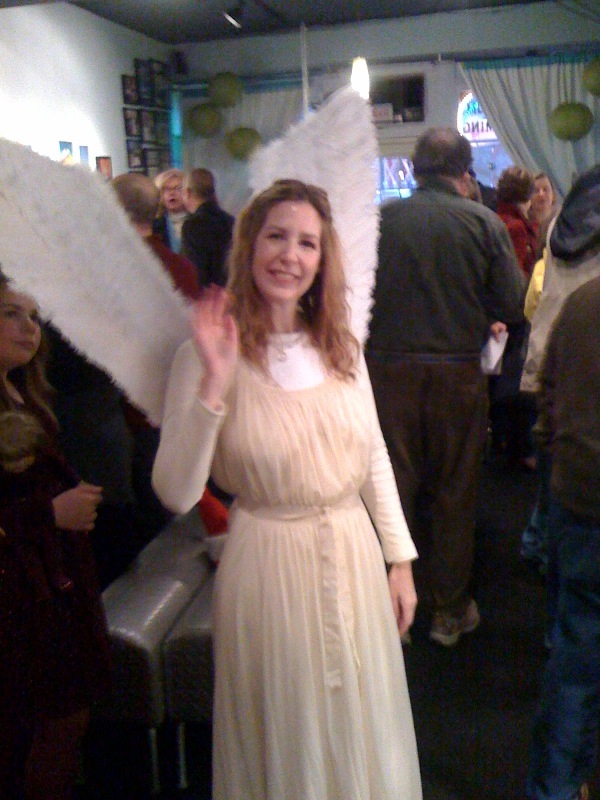 The show attracted an eclectic crowd including this angel. I'm as much freaked out by angels as I am by clowns so it was only the power of the art that kept me from running out screaming when this incarnation wandered in and began her performance. You can catch the show - minus the angel - until January 8 at 67A Broadway, Greenlawn NY 11740 Tel: (631) 239 1805. I adore you for the post and for being there! You and the Guy absolutely ROCK! She'd better order an extra bolt of fabric -I have a very big head!